The craziness that is the 11.11 online shopping festival is finally over. Is your bank account still alive? Apparently, many of you have taken advantage of yesterday’s sale. Shopee Philippines has announced that it sold 1,205,310 items. Even better, rival ecommerce platform Lazada Philippines has released the bestsellers in every category. 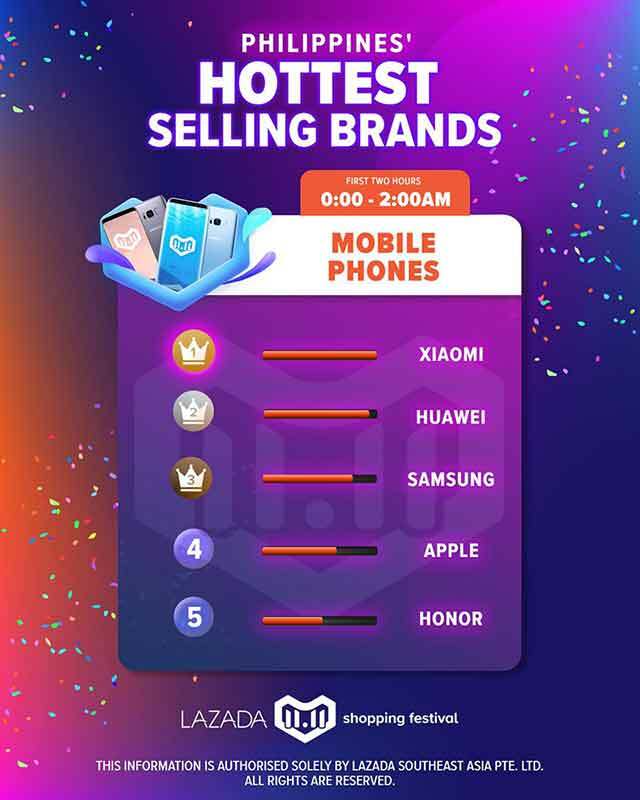 According to Lazada, Xiaomi was the runaway winner in the mobile-phone group by 12 p.m. on November 11. 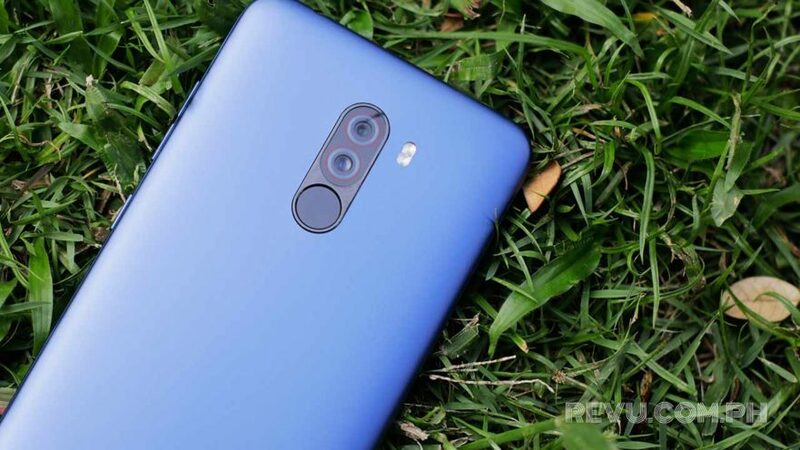 In fact, its Redmi S2 and Pocophone F1 handsets landed second and third in the overall category. Pampers Baby Dry XL Diaper Pants snagged the top spot. We weren’t able to monitor the discounted price of the P7,990 (around $150) Xiaomi Redmi S2 from 12:01 a.m. to 2 a.m., when the really great deals were on offer. But we know that the Pocophone model with 6GB RAM and 64GB storage, priced at P17,990 ($339), was only P15,990 ($301) at the time. At the start of the sale, the counter showed that there were almost 600 units sold. 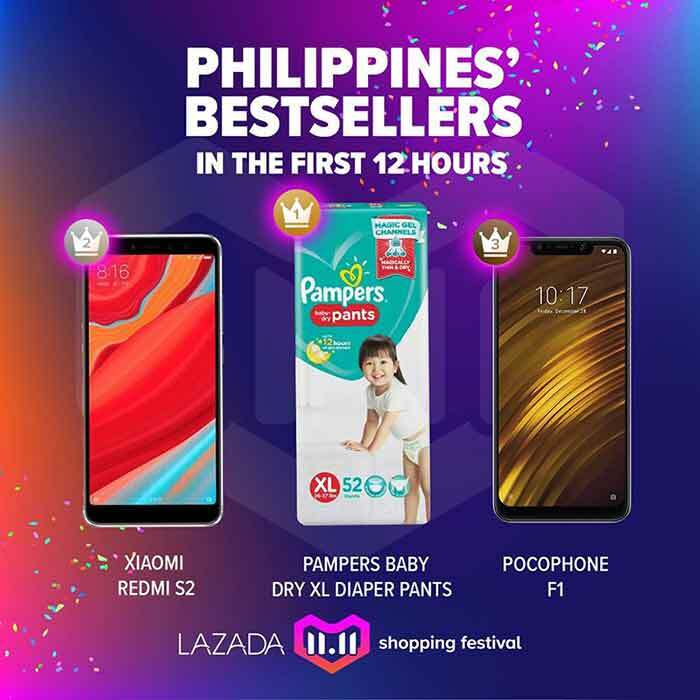 Unfortunately, we were not able to check it again at 2 a.m.
Lazada has also disclosed the top five phone brands within the first two hours of the 11.11 sale. The image below shows that Xiaomi, Huawei, Samsung, Apple, and Honor were the hottest-selling of them all. Admittedly, we were surprised by Apple’s performance in the country given the prices of its devices. Then again, do take note that the list is representative of the one for the world’s top five biggest smartphone companies. We asked our contact at the ecommerce site if they are working on a list for the whole 24 hours of their biggest one-day sale. We likewise inquired how the sales this year were compared with last year’s, though in an earlier statement to the Philippine Daily Inquirer, Lazada had said they were expecting sales to double. We’ll update this article as soon as we get a reply.